The Rubio Doctrine sounds an awful lot like the Romney Doctrine. 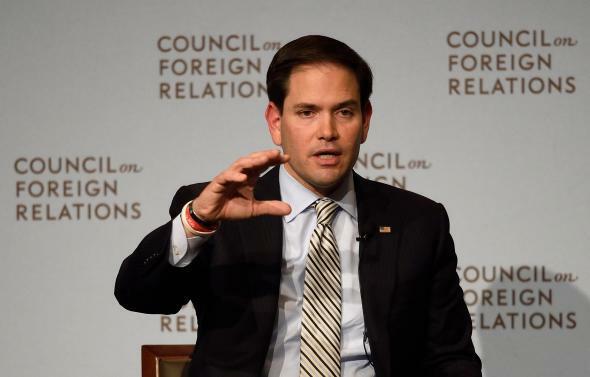 Presidential candidate and Florida Republican Sen. Marco Rubio speaks at the Council on Foreign Relations in New York on May 13, 2015. In a speech at the Council on Foreign Relations today, presidential candidate Marco Rubio unveiled what he’s calling the Rubio Doctrine. It’s not really a “doctrine”: Most of the previous doctrines named after presidents (which Rubio is not) have been specific policies in response to specific circumstances, like the Monroe Doctrine, which barred European interference in the Western Hemisphere, or the Truman Doctrine which pledged U.S. support to countries threatened by communism. The Rubio Doctrine, by contrast, is a set of broad talking points. It’s also not really distinctively Rubio’s, consisting almost entirely of well-worn neoconservative arguments. This doctrine, such as it is, consists of three pillars: “American Strength,” the “protection of the American economy in a globalized world,” and “moral clarity regarding America’s core values.” The “deterioration of our physical and ideological strength has led to a world far more dangerous than when President Obama entered office,” Rubio said in his speech, full of words, arguing that this lack of strength has emboldened America’s adversaries. If this all sounds familiar, it should. When Mitt Romney was running for president in 2012, his central critique of Obama’s foreign policy was over his failure to communicate “American strength and resolve.” Rubio, like Romney, ended his speech by promising that the 21st century will be another “American century.” He even recycles one of Romney’s favorite (misleading) talking points: that America’s Navy has shrunk to pre-World War I levels thanks to Obama’s defense cuts. Of course, Rubio won’t be running against Obama. But today, at least, he only referenced Hillary Clinton once in reference to trade policy. If, as some are predicting, foreign policy is more prominent in this election thanks to a long list of global crises and a relatively improved economy, Rubio’s plan of attack seems to be to make it a referendum on Obama’s handling of the world. He certainly isn’t offering anything new.